What are the rules for t-shirts or other garments for athletics? Again, a Loper head, OR the slanted UNK art elements are required on athletics garments. Can I change the logo or Loper head, make it yellow, for instance? UNK logos, marks and indicia are property of UNK. UNK logos are never to be changed: No alterations to color, no shading, outlining, stretching, squeezing, and no substituting colors. The UNK marks will never be conveyed in yellow/gold. Only white, black or blue (+gold metallic). The Loper head will never be conveyed in yellow or black. Only white or blue. The Loperhead and the slanted UNK should not be superimposed on top of another element, or another element placed on top of it. The Loper head always faces right. The UNK athletics slanted/italic logo always slants right. What about sport-specific logos? Can I change the logo so it reflects a specific sport? Logo “lockups,” or co-branded logos, have been developed for each sport (see the brand/art sheets, where they are called “extension marks”). Promoting individual sports is great. You are asked to use the co-branded marks that have already been developed. All marks on the art sheet referenced are always approved for use. What if I want something special or unique for my team garment? Repetition and consistent use of the athletics marks is so important. We understand that personal and individual style and flair are part of the process of enjoying and appreciating being part of a team, but remember the important attributes of branding and brand recognition. A certain amount of creative leeway can be encouraged, just work with the guideline that a Loper head or UNK athletics logo must be on the shirt or garment front. It’s generally OK to use stylized type that does not change the appearance of the brand artwork, and images that convey the sport, but keep the focus on UNK and/or the Loper head. Visit with athletics equipment manager Phil Noah, and/or a Communications and Marketing designer at the beginning of your design process for guidance. I work for UNK. Doesn’t that mean I can use the UNK logos? Ownership of UNK’s marks does not transfer to a student, faculty or staff. If you are intending to use the UNK logo on items that will have wide circulation (off campus), or will be sold, you will need to obtain permission of your artwork and its use through Communications and Marketing. If you are selling your items, they will need to be licensed through our license agent, Learfield. Can I use any t-shirt company to create stuff with UNK logos? Sure. As long as they are licensed through Learfield and have access to our university logos. Most Kearney-area material producers are licensees and we work with them often to print or create UNK material. Most seek our approval before printing, so, it would probably be easier to come to Communications and Marketing first to get your design developed, or in the case of athletic department-sponsored team gear, you will need to work with Phil Noah. That will avoid any lost time due to changes. Moonlight and 24 Hour Tees send your designs to us for approval. I worked with Moonlight/24 Hr Tees on a design. How long will it take to get approved? These are sent to Kelly Bartling and Phil Noah (in the case of team gear) for approval, and approval turnaround is less than 24 hours. If you have questions about whether your design will get approved, talk to Kelly before submitting. What are the current UNK marks? View the Art Sheet. The most recent update is from May 2016. You may notice the K with a Loper head on it, and several antelopes, have been phased out. What are UNK’s official colors? UNK uses Pantone 294 (blue) and Pantone 131 (gold). These are listed on the PDF. All printers and designers are familiar with Pantone. View more information about color specifications. Can academic, student, or other UNK programs use the Loper head or the slanted UNK? Keep in mind the Loper head is a licensed/registered trademark and you are subject to the guidelines above. The Loper head has been used, traditionally, to communicate about UNK athletics. 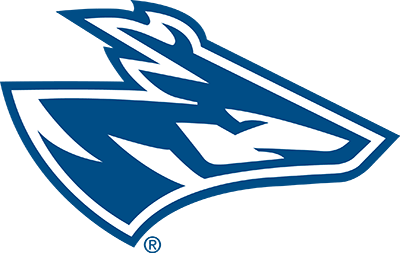 The Loper head is also our school spirit mark, conveying pride, energy, and accomplishment, most often through UNK sport. If you are communicating about UNK team spirit, the Loper head may indeed convey this. Again, it’s best to consult Communications and Marketing before deciding on a design element or mark; context is everything. Can I use camouflage as a basis for a garment? We don’t find this offensive, but some people might. Proceed with caution. What about for a camp? Can I create a logo for a sport camp? Is your sport camp an official UNK camp? If so, please incorporate the athletic logos into your camp logo design. We understand camps are special events and are appealing to youth, so additional freedom and creativity will be allowed in creating camp logos. If it’s for a camp, use the word camp on it. If your camp is not a UNK-sanctioned camp, don’t use UNK name or marks. Why is a licensing program necessary? The traditions and spirit shared by the students, alumni and friends of UNK have created a demand for products that display our marks, symbols and insignia. We have an obligation to protect and benefit UNK and constituents through licensing. Licensing, through our agent, also returns revenue through royalties back to the Athletic department. Our licensing agent assists us with increasing our market by contacting retailers and encouraging them to sell our merchandise, it advises us on marketability of products and increasing demand for our products, and it gathers the royalties from retailers selling and making money off our marks. What if I see someone using a logo and I have a question about it? Who is authorized to make decisions about UNK licensing and trademarks? Under Board of Regent policy memorandum the campus Vice Chancellors for Business and Finance are responsible for overseeing licensing on the campus level. At UNK and on a number of the other campuses, the vice chancellor directs the campus’s senior marketing or publications officer to execute and process the licensing guides. At UNK, that is assistant vice chancellor Kelly Bartling.